“Israel is moving forward with attempts to isolate Jerusalem from its surroundings and erase its identity,” Hamdallah said during an opening of a Palestinian food exhibition at an al-Bireh municipality building near Ramallah in the central occupied West Bank. Hamdallah described the recent decision by Israeli authorities to deny the trucks of five Palestinian food production companies from entering Israel as an “oppressive political” decision breaching all commercial agreements and protocols regulating Palestinian and Israeli economic relations. “Through this decision, Israel is attempting to wipe out our national economy and suppress its development,” the Palestinian Authority official said. 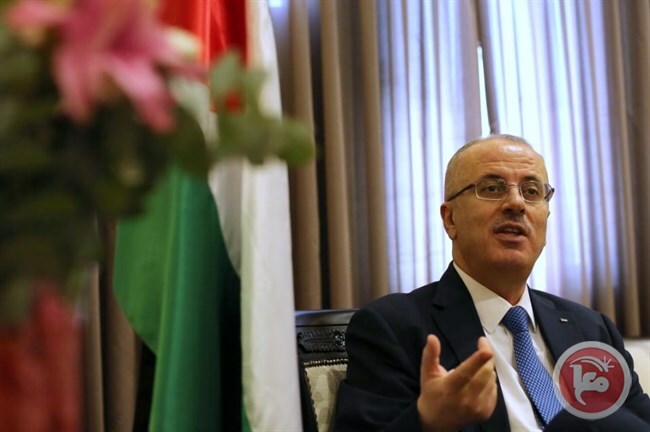 Hamdallah added that the “racist” decision would have devastating consequences for the Palestinian economy, and urged the international community to put pressure on Israel to adhere to its commercial agreements with the PA. The PM threatened to respond by banning Israeli products from entering the Palestinian market. The prime minister pointed to successes in strengthening local production of palms and dates for international export as instrumental in preventing Israeli settlement products from being smuggled into the occupied Palestinian territory. Fadi Abu Hilweh, the director of marketing for Hamoda company — one of the companies affected by the decision — told Ma’an at a protest against the ban that about 50 percent of the five companies’ production goes to Palestinian consumers in occupied East Jerusalem and Palestinian communities in Israel. If this ban continues, he said, the companies could lose some 1.2 billion shekels ($309.5 million) a year. According to the Paris Protocols, an agreement signed in 1995 between the PLO and Israel, bilateral trade agreements between Israel and other parties are considered valid in the occupied West Bank, however Israel prevents the import of many Palestinian products to the Israeli market.